In the mood for something sweet? Curb your craving with our Berries & Cream Bath Salts. As you soak the wonderfully sweet, candy-like aroma of berries and cream fills the room creating a blissful bath experience. 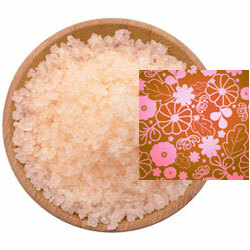 A fine/medium grain blend of Pacific Sea Salt with the sweet aroma of berries & cream in a salmon color.